The MAX6806 MAX6807 MAX6808 precision voltage detectors are ideal for accurate monitoring of power supplies in digital systems. They provide circuit reliability and reduce total cost by eliminating external components and adjustments. 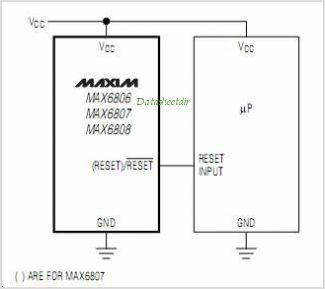 The MAX6806 MAX6807 MAX6808 assert a reset signal whenever the supply voltage (VCC) falls below the factory-preset, 2% accurate threshold. Internal hysteresis ensures stable switching. The MAX6806 MAX6807 MAX6808 are available in 4.6V and 2.6V thresholds (2.3V is also available for the MAX6806 only). 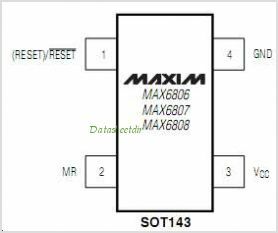 The MAX6806 features an active-low, push-pull RESET-bar output; the MAX6807 features an active-high, push-pull RESET output; and the MAX6808 features an active-low, open-drain active-low RESET output. active-low RESET is valid for VCC down to 1V MAX6806 MAX6808 , and RESET MAX6807 is guaranteed for VCC down to 1.2V. The MAX6806 MAX6807 MAX6808 are available in 3-pin SC70, 3-pin SOT23, 8-pin MAX, 8-pin SO, and 4-pin SOT143 packages. The SOT143 package includes a manual-reset input. This is one package pinout of MAX6808,If you need more pinouts please download MAX6808's pdf datasheet. This is one application circuit of MAX6808,If you need more circuits,please download MAX6808's pdf datasheet.